IN ACCEPTABLE CONDITION. HAS WEAR, SOME DISCOLORING, SOME WRITING ON BOTTOM & NEEDS TO BE CLEANED. DOES NOT COME WITH INK OR PAPER. See all photos for details. As a scientific calculator, the Texas Instruments TI-5045 builds off of the basic functions to provide its user with a versatile machine capable of being used with more complex mathematics. 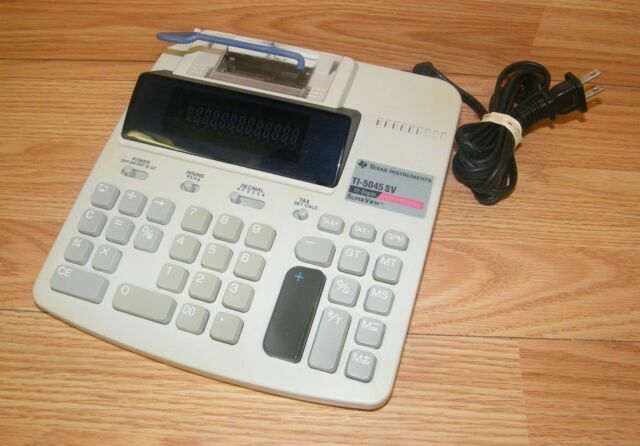 This Texas Instruments calculator comes with a number of functions that facilitate its use in financial situations as it possesses the capacity to have a tax rate program in its memory. Once programmed, a user can automatically incorporate the tax rate into their equations at the touch of a button. The paper printout of this Texas Instruments calculator allows a user to follow along with their calculations and keep equations relevant to their records. Most major functions on this scientific calculator are toggled through switches that allow a user to configure the calculator for use with their primary work. The ink rollers for the Texas Instruments TI-5045 are placed in a readily accessible location. This Texas Instruments calculator supports both red and black inks to allow a user to easily distinguish between separate sections of their work. I was delighted to find another of this model calculator which is perfect for my needs. No fancy buttons that rarely are used. Nothing at all bad about this machine! This was bought for a friend so that she can (finally) reconcile her bank account. It works great and she loves it. We had a terrible experience with one we bought on eBay that DID NOT WORK AT ALL and one that was too complicated for her to use,(but our town's "historical society" now uses it!) This one, the TI5045, is perfect and maybe now she'll know what she REALLY has in the bank! I have used this particular calculator for over 5 years and have been most comfortable in its performance to do the calculations that I need to do. When my unit died, I was desperate to find a replacement. Ebay allowed me to find the TI 5045 Calculator that is no longer available in the market today. I purchased a TI-5045 II (slight variation from the SV) brand new more than 20 years ago. Earlier this year, a small piece of rubber that grips the paper to feed finally gave up and split. I tried to glue it back together, but the rubber was just too old. These are great adding machines and I was very happy to find another working model for a reasonable price through EBay.